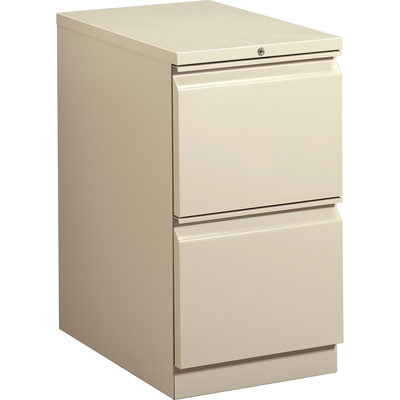 Heavy-duty pedestals with radius pulls to complement Brigade® 800 Series Lateral Files. High sides for front-to-back letter size filing. Ball bearing suspensions on file drawer (90% extension) and box drawer (75%) extension. HON® "One Key" interchangeable lock core. Counterweight inhibits tipping when opening more than one drawer. Fixed front casters; swivel back casters. Fits under 29 1/2" high worksurfaces.